We are happy to announce that RIEGL Laser Measurement Systems, Austria has become a sponsor of the award-winning LASzip compressor. Their contribution at the Silver level will kick-off the actual development phase of the “native LAS 1.4 extension” that had been discussed with the LiDAR community over the past two years. 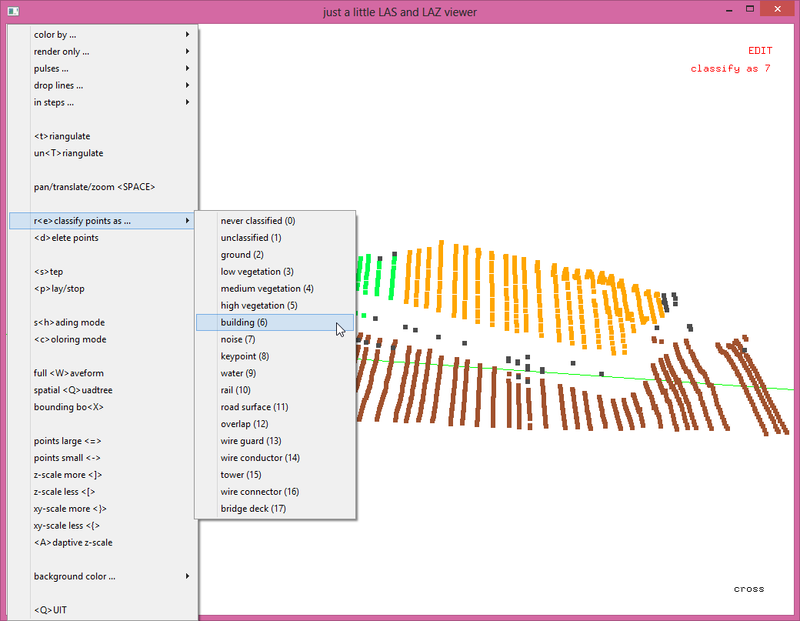 This “native extension” for LAS 1.4 complements the existing “compatibility mode” for LAS 1.4 that was supported by Gold sponsor NOAA and Bronze sponsors Quantum Spatial and Trimble Geospatial. 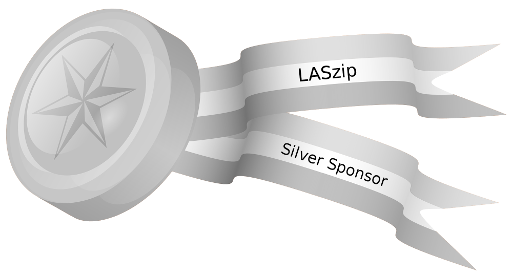 The original sponsor who initiated and financed the open sourcing of the LASzip compressor was USACE – the US Army Corps of Engineers (see http://laszip.org). The existing “LAS 1.4 compatibility mode” in LASzip was created to provide immediate support for compressing the new LAS 1.4 point types by rewriting them as old point types and storing their new information as “Extra Bytes”. As an added side-benefit this has allowed legacy software without LAS 1.4 support to readily read these newer LAS files as most of the important fields of the new point types 6 to 10 can be mapped to fields of the older point types 1, 3, or 5. 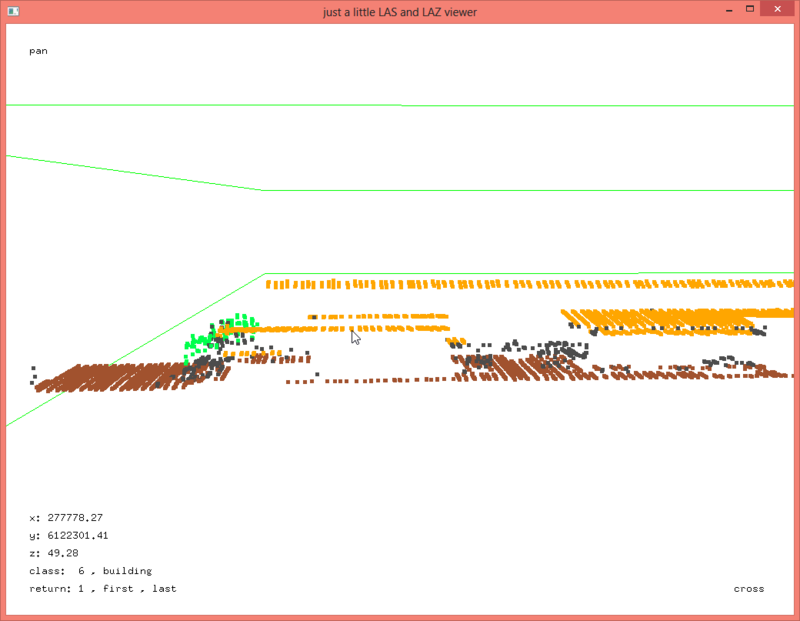 In contrast, the new “native LAS 1.4 extension” of LASzip that is now sponsored in part by RIEGL will utilize the “natural break” in the format due to the new point types of LAS 1.4 to introduce entirely new features such as “selective decompression”, “rewritable classifications and flags”, “integrated spatial indexing”, … and other functionality that has been brain-stormed with the community since rapidlasso GmbH had issued the open “call for input” on native LASzip compression for LAS 1.4 in January 2014. We invite you to follow the progress or contribute to the development via the discussions in the “LAS room“. Austrian based RIEGL Laser Measurement Systems is a performance leader in research, development and production of terrestrial, industrial, mobile, bathymetric, airborne and UAS-based laser scanning systems. 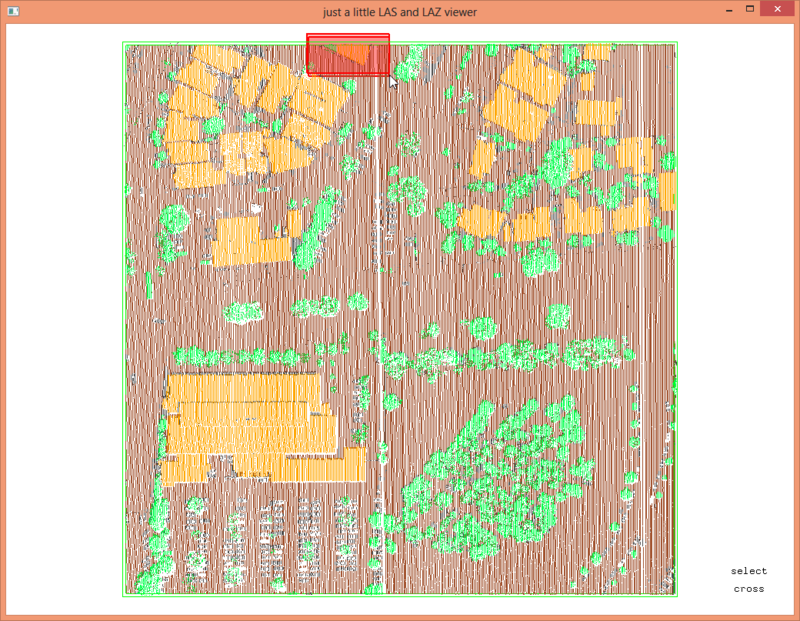 RIEGL’s innovative hard- and software provides powerful solutions for nearly all imaginable fields of application. Worldwide sales, training, support and services are delivered from RIEGL‘s Austrian headquarters and its offices in Vienna, Salzburg, and Styria, main offices in the USA, Japan, and in China, and by a worldwide network of representatives covering Europe, North and South America, Asia, Australia and Africa. Visit http://riegl.com for more information. Side note: I am not entirely happy with the terminology of a “Normalized Digital Terrain Model (nDTM)”. 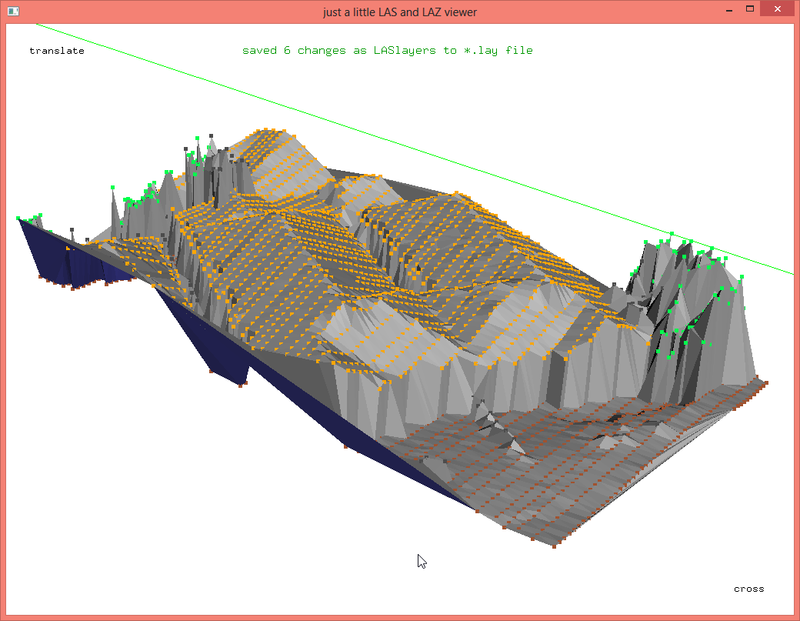 Jarlath writes: “A similar approach is used to create a Normalized Digital Terrain Model (nDTM). A DTM is generated from the last returns. 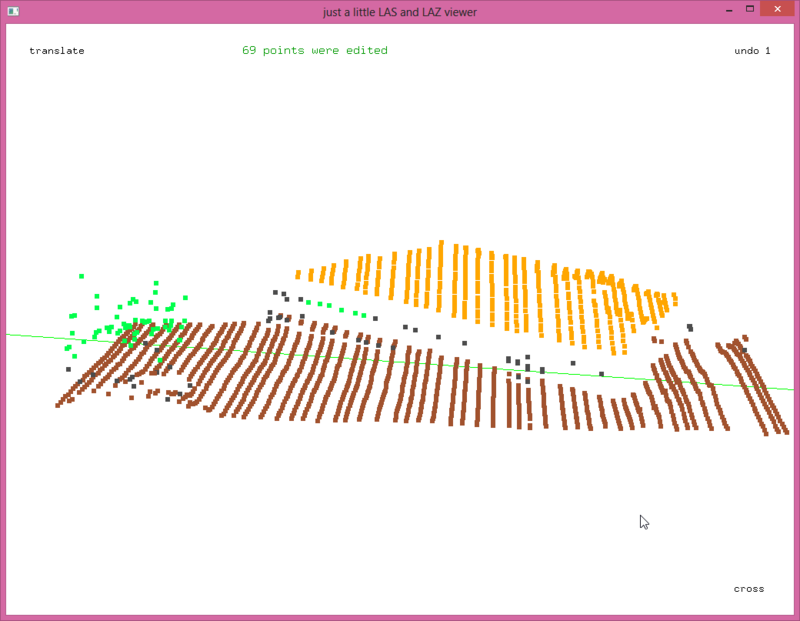 The DEM is then subtracted from the DTM to create the nDTM.” I like to reserve the term “Digital Terrain Model (DTM)” for bare-earth terrain computed from returns classified as ground. The return-difference rdDEM shows the height difference between first and last returns. Does this work well for you? 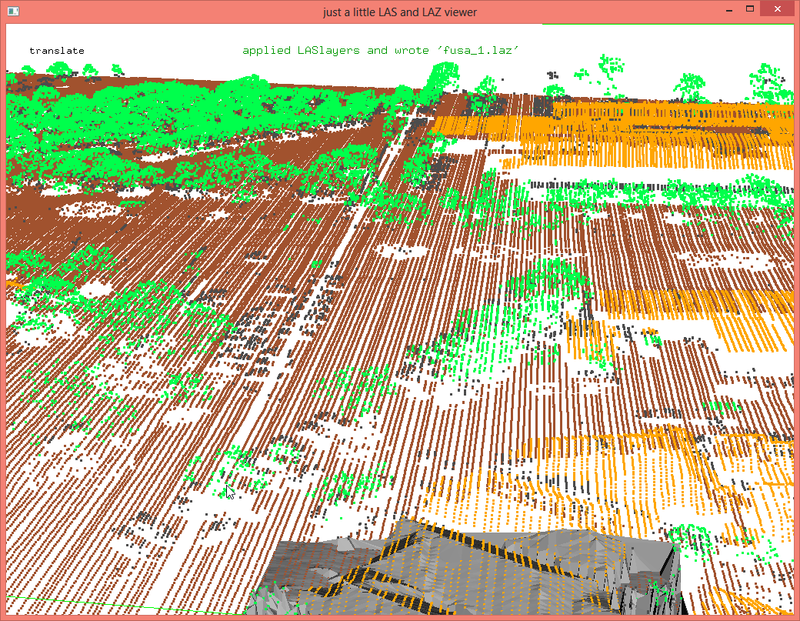 The results on the “fusa.laz” data set are not entirely convincing … maybe because the vegetation was too dense (leaf-on?) so that the LiDAR penetration is not as pronounced. You can switch back and forth between the first-return and the last-return DSM by loading both *.bil files into lasview with the ‘-files_are_flightlines’ option and then press hotkeys ‘0’ and ‘1’ to toggle between the points and ‘t’ to triangulate the selected DSM. 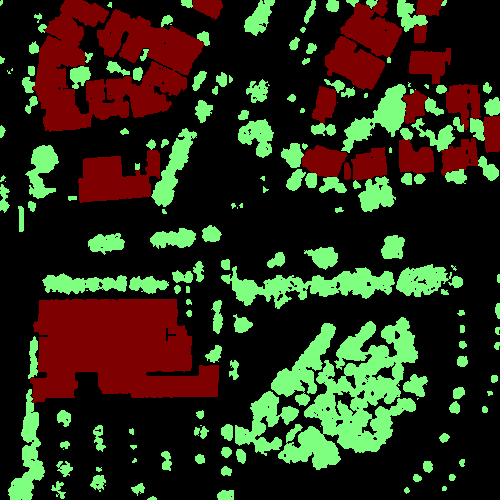 We should point out that for Jarlath the return difference raster rdDEM is just one part of the pipeline that is followed by an object-based approach in which they integrate the spectral information from aerial imagery and then use iterative expert systems to further improve the tree canopy classification. 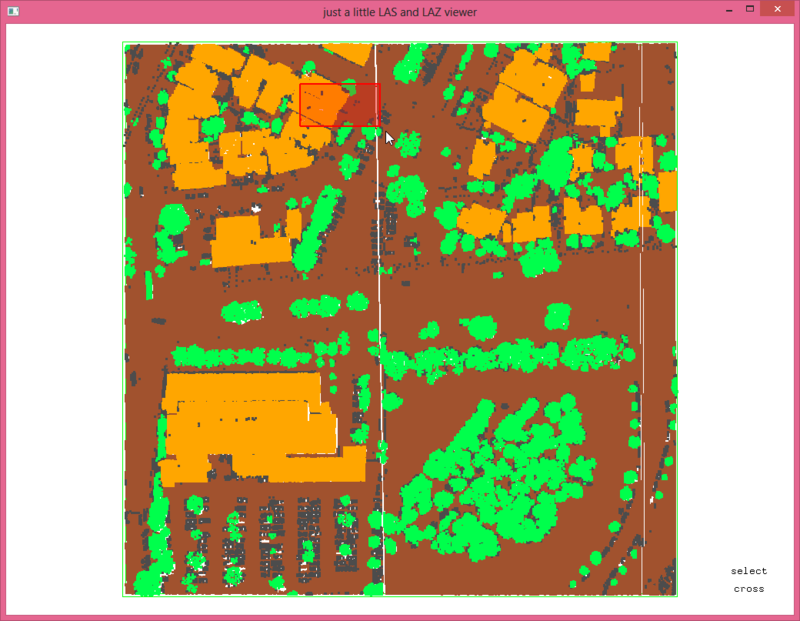 Automated building and vegetation classification with lasclassify. 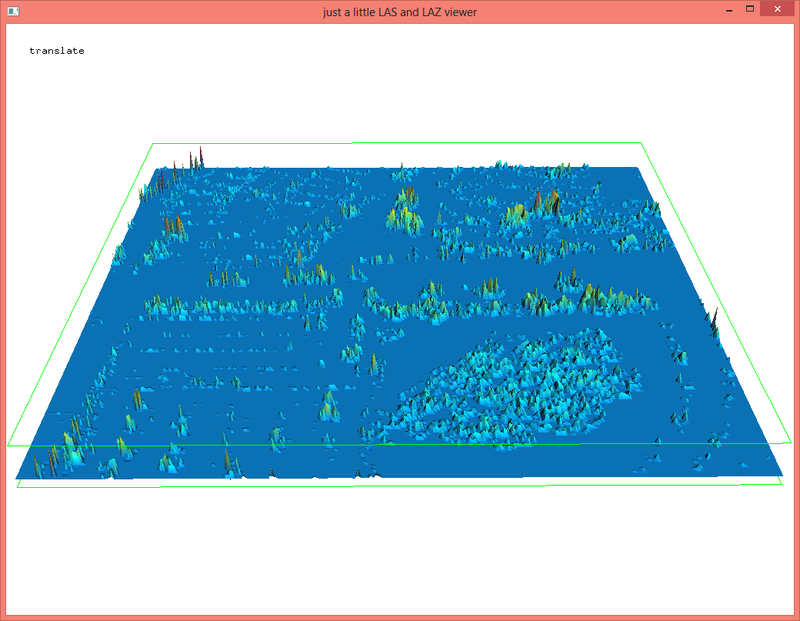 Using lasgrid there are many ways that can easily turn the classified point cloud into a raster so that it can be used for subsequent exploitation together with other image data using a raster processing software. An example is shown below. Alternatively we can use lasboundary to create a shapefile describing either the vegetation or the buildings. 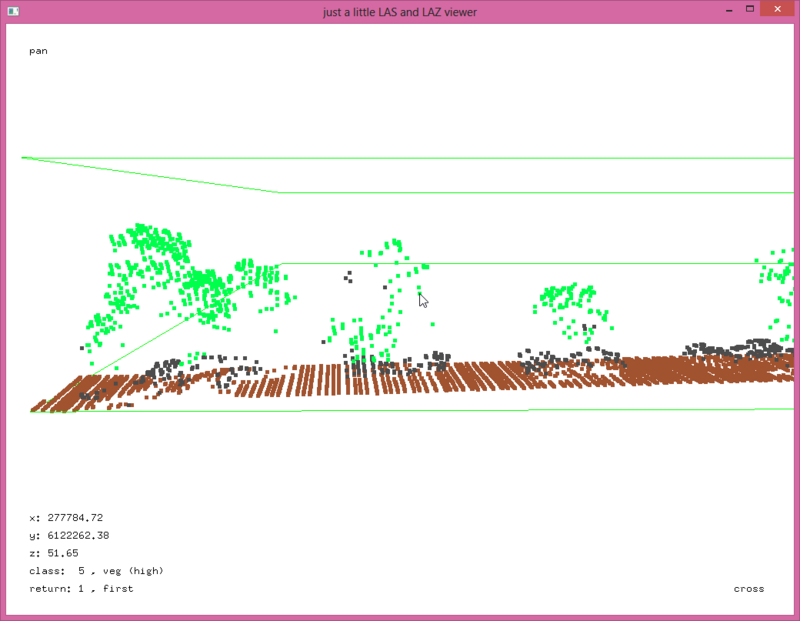 SHP file generated with lasboundary with polygons describing the vegetation. 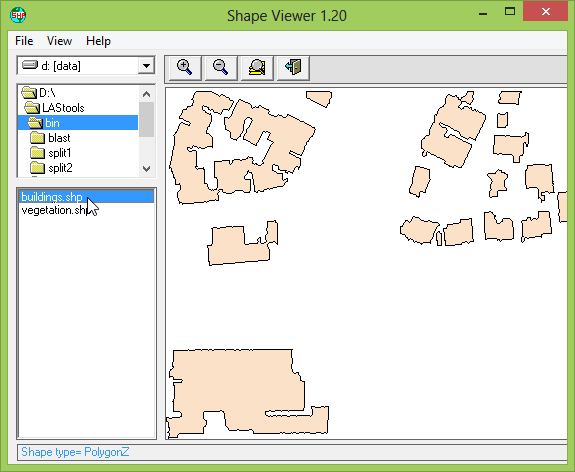 SHP file generated with lasboundary with polygons describing the buildings. Press the <x> key to toggle to “select cross” where you can pick a rectangular “cross” section. The default cross section is a profile extending across the bottom of the bounding box. By pressing the <x> key again you toggle back to actually view the cross section. Holding down <ALT> you can rotate the view to look at the cross section from the side. Holding down <CTRL> you can zoom in and out. Holding down <SHIFT> you can translate up and down or left and right. Increase or decrease the size of the points pressing <=> or <->. 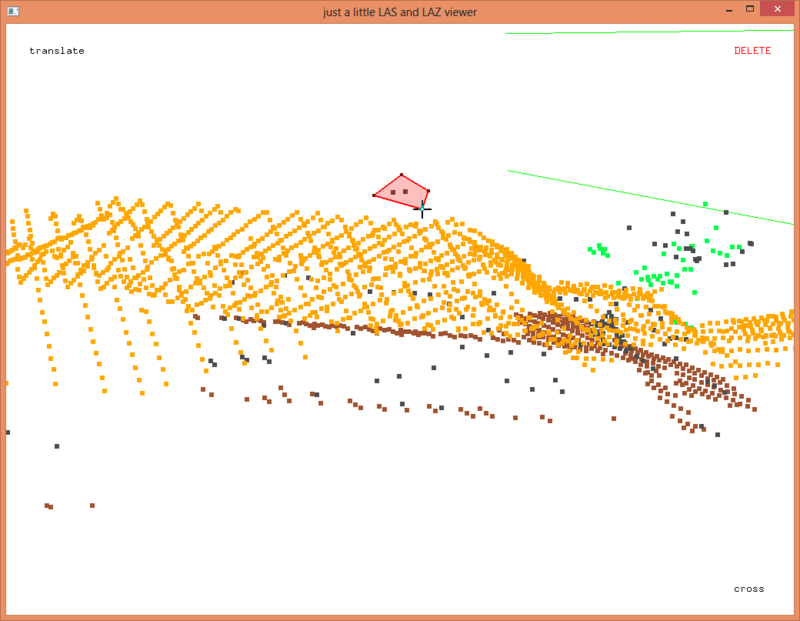 Hover with the mouse over a point and press <i> to inspect its coordinates and attributes. 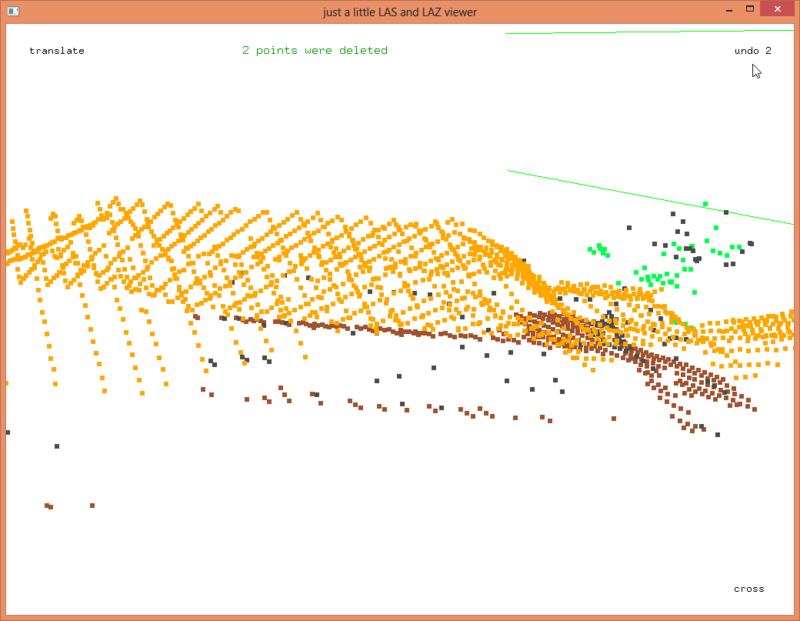 Traverse the LiDAR file visually by moving the cross section with the arrow keys <UP> <DOWN> <LEFT> and <RIGHT>. 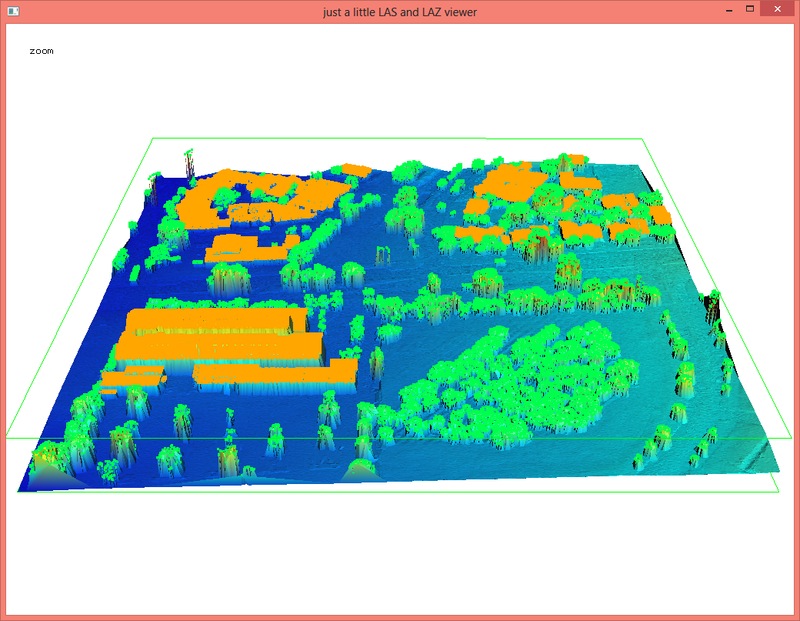 You can move either in the “select cross” view and see the picked rectangle move or in the “cross” view and “walk” through the LiDAR. Hold down the <SHIFT> key simultaneously to take bigger steps or the <ALT> key to take smaller steps. Inspect other points by hovering over them with the cursor and pressing <i>. The point information disappears when pressing <i> with the cursor over the background. Continuing the steps above, toggle back to the “cross” view by pressing <x>. Note that part of the roof of the house has been miss-classified as vegetation while others are left unclassified. Press <e> to turn on the “EDIT” mode and right-click to select “reclassify points as building (6)” via the pop-up menu. Now use the cross-hair cursor to draw a polygonal fence around all points that should be reclassified. Press <ESC> to remove the last vertex of the polygon if you miss-placed it by a mistake. Once you are happy with your polygon press <r> to register the edit. A note appears informing you how many points had their classification changed. In the top right corner an “undo” counter appears informing you how many changes you can undo by pressing <CTRL-u>. Try it. Immediataly the changes disappear and a “redo” counter appears instead. Press <CTRL-o> to redo the change you have just undone. Press <CTRL-s> to save this edit as a tiny LAY file using the recently introduced LASlayers concept. In case there was already an existing LAY file (that was not applied with ‘-ilay’ when starting lasview) you will be warned and have to press <CTRL-f> to force overwriting it as shown below. Press the key sequence <SHIFT-b>, <t>, and <a> to get the same visuals above. Press <SHIFT-t> to remove the triangulation again. After saving an edit it can no longer be undone via <CTRL-u>. Instead you will have to strip off this particular layer with the layer management available through “laslayers.exe” as described here. Now press <x> to toggle to the “cross select” view. Use the <DOWN> arrow to move the selected cross section to the area shown above that has a few unclassified points in the middle of the roof. Press <x> to go back to the “cross” view and try to understand why these points are not part of the roof. Looks like they are from the top of a chimney, and antenna, or a satellite dish as they do not fit the otherwise planar roof. Assume we need to remove them for some reason. Pan, translate, and zoom the view such that these points can be easily surrounded by a polygon. Now press <d> to enter the “DELETE” mode, fence in these points, and press <r> to register the deletion. 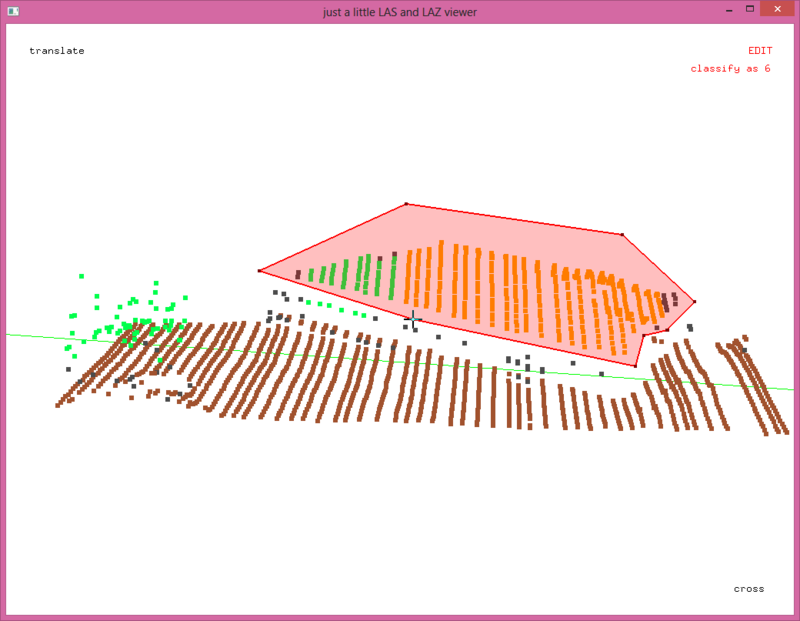 It can be tricky to place a clearly seperating polygon and you may be worried about deleting a few orange building points as well. Press <u> to only display the unclassified points before pressing <r> to register the deletion. 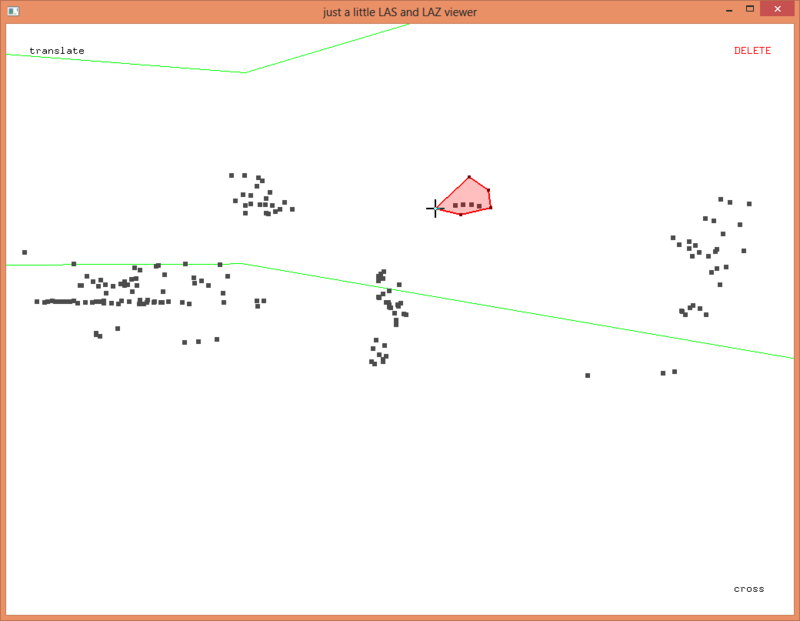 Press <a> to see all points again, then delete the other two points by finding a good view point, pressing <d>, and drawing a polygon. After registering this deletion of two points your “undo” counter should be at two. Press <CTRL-u> twice to undo this and the last deletion, then press <CTRL-o> twice to redo them both. Now press <CTRL-s> to save this deletion as another layer. 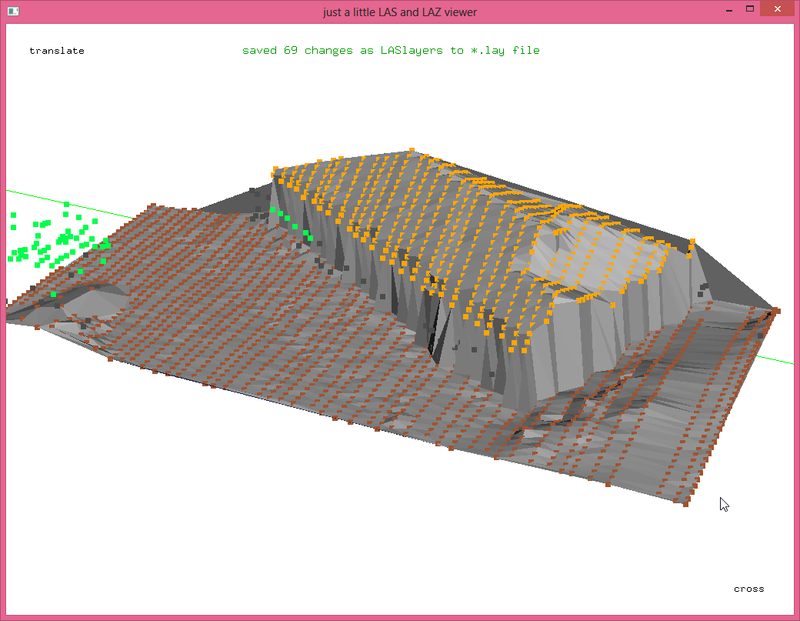 It will be appended to the LAY file that already contains one layer with the roof re-classification edit we did first. 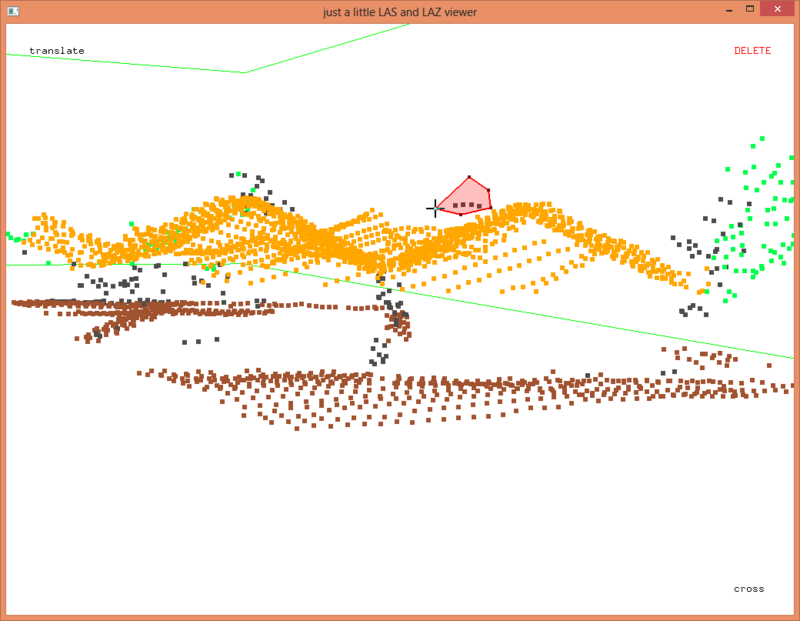 Press <t> to triangulate the points in the “cross” view. See how nicly flat the triangulated roofs are now that we deleted these 6 chimney points. Look at the size of the tiny LAY file called ‘fusa.lay’ that is in the same folder as the ‘fusa.laz’ file. It contains all the edits we have done so far and mine is only 681 bytes in size. The original LAZ file has not changed. Maybe this is all you want for now. You could send only this tiny LAY file to a colleague elsewhere and he or she could apply those changes locally when needed using the ‘-ilay’ switches. For more on this see the LASlayers page. However, you may want to eventually apply the changes and produce a new LAZ file. This will be a lot slower as it requires rewriting the entire file. It will also make changes permanent. Press <CTRL-a> and a new file is produced called ‘fusa_1.laz’ that has 6 points less than ‘fusa.laz’ and 69 points with a different classification as “building”. One more thing, press <CTRL-x> if you want to toggle between the “cross” section view and the default view. You need to have a license to LAStools to save edits for file that contain 1 million points or more.